(Coco)nuts for mango cake! 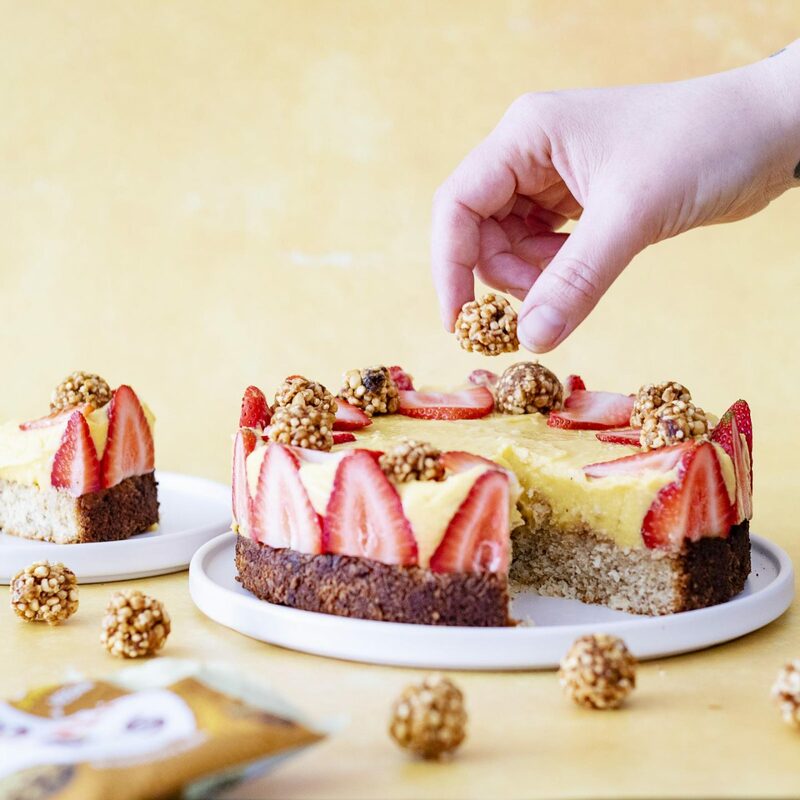 This colourful and delicious Mango Coconut Cake is vegan, gluten free & also palm oil free – with a baked base and a delicious filling ‘baked’ by our fridge. Preheat your oven to 200C. Grease your cake tin (ideally 9’’) and sprinkle coconut shreds across the bottom. In a large bowl cream the butter with brown sugar, vanilla extract and pinch of salt. Using a separate bowl, break the marzipan using the back of a fork and blend it with the juice of 1 orange until smooth. Add the marzipan mix as well as apple puree to the creamed butter. In a separate bowl combine the flour, baking powder, cocoa powder, then add it to the liquids alongside the coconut shreds and hazelnuts.Pour the batter into your cake tin and bake it in the middle of your oven for about 25 minutes. Once removed, let the cake base cool down completely. For your cake filling, combine the coconut milk with the Agar Agar and heat the mix for 1-2 minutes whilst continuously stirring. Let it cool down to room temperature, then add in the mango puree, lime juice and powdered sugar. Stir in the whipped cream and combine everything until smooth. Line the sides of your cake tin with baking parchment and decorate the outer edge of the tin with strawberry halves. Gently pour the cake filling onto the cooled bake base and smooth the top with a pallet knife or spatula. Place the cake in the fridge for about 4 hrs to set. 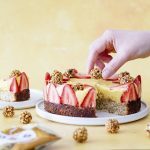 Decorate the cake before serving – I love getting creative with whipped soy cream, strawberries and Perkier bites! To decorate the cake wait until it’s completely set – this takes about 4 hours in the fridge, or ideally overnight.